Taking up the cause of ex-servicemen who had recently returned their medals to the government protesting against the non-implementation of their demand for “one rank, one pension” (OROP), Rajya Sabha member Tarlochan Singh on Friday criticised the government for not paying heed to their rightful demands. Singh raised the issue during the Zero Hour and said that while several provisions had been made for other government services like the IAS, the government was not paying enough attention to the rightful needs of the soldiers of the country. He said this attitude was adversely affecting those serving the nation. Terming the threat of terrorism from Pakistan as a “global menace and cancer”, India today linked the future of Indo-Pak ties with the actions the neighbouring country takes in the coming days to bring to justice the masterminds of the Mumbai terror attacks. “I must underline that we have no quarrel with the people of Pakistan. 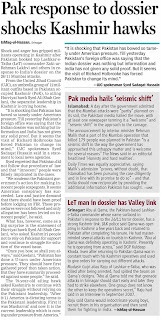 We wish them well and do not think that they should be held responsible or face consequences of this situation,” External Affairs Minister Pranab Mukherjee said in a suo-motu statement in Parliament, a day after Islamabad admitted that the conspiracy to mount the attacks was partially hatched in Pakistan. Mukherjee said India had consciously and after due deliberations not thought it necessary or fit to curtail people-to-people contact and train and road links. He highlighted the sequence of events in India-Pakistan ties ever since the heinous attacks took place in India’s financial capital on November 26, claiming the lives of nearly 180 persons. Since December 1 last year, the Minister pointed out, the bilateral dialogue between India and Pakistan had been at a pause. The chief of the Defence Research and Development Organisation (DRDO) M. Natarajan today announced that India would test a new version of the Agni series of missiles. This would be an intermediate range missile that could traverse about 5,500 km. This would be called the Agni-V and would be tested by end of 2010, Natarajan told reporters at the Aero India show here this morning. Detailing the DRDO plans he said it could develop a medium range combat fighter to follow the light combat aircraft fighter. On missiles India lags behind China that has in its possession a large number of Inter-continental Ballistic Missiles (ICBM) capable of reaching targets beyond 10,000 km. 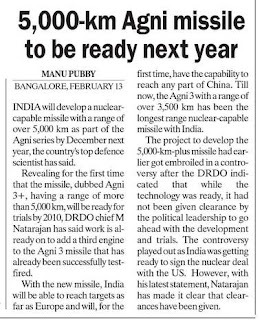 In sharp contrast, the most powerful ballistic missile in India’s possession is the Agni-III, designed to reach a target at a distance of 3,000 km, this was successfully fired last May and is ready for induction. It may be mentioned here that the Union government has sanctioned Rs 2,500 crore for developing the country’s most ambitious missile, a nuclear-capable Agni-V. This is just a step short of an ICBM. The government has not considered an 8,000-km range ICBM. Agni-V is likely to have solid propellants. With a view to increasing its surveillance capabilities, Indian Air Force is going to have its own satellite in space by the end of 2010. "We will launch our satellite by the end of 2010," IAF chief Air Chief Marshal Fali Homi Major said here yesterday. The satellite to be launched by ISRO next year will be a dual-use satellite and will be used for civilian purposes also. It will help the IAF to position its aerial and ground assets and targets. It would be used to gather navigational information. In the recent past, IAF has been working closely to develop its space-based capabilities. It even has plans of setting up an Aerospace command under it but it has faced opposition from the other two services over the issue. Its southern command based in Thiruvananthapuram works closely with ISRO in space related areas. At the air headquarters also, one Air Vice Marshal rank officer looks after space operations. MUMBAI (Reuters) - Mahindra & Mahindra Ltd, India's top utility vehicle and tractor maker, said on Friday it will spin off it defence business into two wholly owned units that it intends to list at some point. The conglomerate was targetting revenues of of about 20 billion rupees ($410 million) in five years from its land and naval defence system business, Mahindra Defence Systems chief executive Brigadier Khutub Hai told Reuters. The defence business currently has revenues of about 1 billion rupees, he said. The separation would create more value for its shareholders through a greater focus on them, he said. Mahindra's land systems business has government approval for a joint venture with BAE Systems that will start by April, he said. Mahindra would invest $6.5 million for a stake of about 74 percent in the venture, and was looking for a partner for its naval systems business, he said. Hai said Mahindra would be looking to list the companies at some point in the future. Mahindra's defence systems division provides a range of armoured and combat vehicles and simulators for weapons and weapon systems for the army and the navy. For well over two decades now, India has fought terrorist-style violence in the disputed territory of Kashmir. The 26/11 terror attacks in Mumbai have now globalized this fight. As the world watched the 60-hour-long tragedy unfold on its TV screens, militants said to be associated with the Pakistan-based Lashkar-e-Taiba ("Army of the Pure") targeted India's financial capital, its icons (the 104-year-old Taj Mahal Hotel) and citizens from 14 countries, including the U.S., Canada and Israel. Also targeted, implicitly and directly, were India's middle and upper classes, the habitués of the areas that came under attack. And as these groups set the national agenda, it can be said that the Mumbai attacks have suddenly changed the rules of the game for New Delhi. Formerly a special correspondent and deputy news editor with the Times of India in New Delhi , Gurmukh Singh is currently Canada correspondent for Indo-Asian News Service. As the current national mood shows, these westernized classes are leading the calls for revenge against LET and its backers in Pakistan. They want India to reconsider its non-aligned mentality and join in earnest the global fight against the jihadist movement. Many ask: when the West and India face the same enemy operating in this neighbourhood — Pakistan's tribal areas and the mountains of Afghanistan — why can't the two join hands to defeat it? It's a very good question. It has been eight years since the al-Qaeda-engineered attacks on the U.S. and in that time the contours of this clash have only broadened. Apart from a few spots in the Middle East and the Maghreb in North Africa, the main source of this jihadist movement can be traced to Afghanistan and Pakistan. As British Prime Minister Gordon Brown observed at the end of 2008, three-quarters of all the serious terror plots in Britain were hatched by men with links to Pakistan, as were the 9/11 attacks in 2001. In the case of Lashkar-e-Taiba, it was created in the late 1980s, many say by Pakistan's Inter-Services Intelligence agency, to help oust India from Kashmir. But it has since graduated to become a global jihadist outfit, with tentacles spread right across Pakistan. This presents problems for India, of course. But because of its historical interaction with this ideology, not to mention its geography and cultural affinities, India has a much deeper understanding of this menace and thus is well placed to be an invaluable ally to the West. To do this, however, New Delhi needs much more Western support, or at least Western pressure on Pakistan, as LET has taken its fight to India 's mainland from deep within the Kashmir valley. Above all, India needs Western help to acquire new skills and weaponry to defeat terrorism in its cities and also to hit LET at its source. To meet the LET challenge, India basically has two options. The first is to carry out Israeli-type strikes at the terrorist training camps in Pakistan and Pakistan-controlled Kashmir. But this option is the least likely to pursue as India does not have the same overwhelming military superiority over its neighbour as the Israelis do over Hamas in the Gaza Strip. The second and most likely option is to become a central part of the global fight against Islamic terrorism. But getting into this battle won't be easy either. For one, India would likely face internal problems because of its huge though widely scattered Muslim population of about 150 million, many of whom are against any truck whatsoever with the U.S. and Israel. New Delhi's predicament is also compounded by the fact that it needs the oil-producing nations of the Middle East — fellow members of the Non-Aligned Movement — to help it meet its energy needs. The West, too, will have a problem in bringing India on board in a more determined way, though the Bush administration made a start by opening the door to more cooperation on nuclear energy. Washington, however, is unlikely to want to rope in India at the expense of Pakistan because, absent Russia's help, the U.S. needs Pakistan's staging points and land routes to help supply its forces in Afghanistan. The West also needs Pakistan's help, or at least its acquiescence, if Western forces are to attack the training camps in Kashmir or the Pakistani tribal areas, an action that would probably be easier to undertake if India, Pakistan's traditional enemy, was not seen as part of the attacking force. Joining the big western powers in their fight against jihadist terrorism would be an about-face for New Delhi policy makers. But they have done this kind of thing before. In 1991, when it was almost bankrupt and had to mortgage its gold savings with the Bank of England, India abandoned its socialist economic policies and embraced open markets. The results — one of the fastest growing economies in the world — are there for all to see. But if that economic crisis proved to be a turning point for India's integration with the West, the Mumbai terror attacks should prove to be the same on the security and intelligence fronts. The two sides have already taken important steps in deepening their strategic ties. Indian intelligence teams have been working with their Israeli counterparts for some time now to formulate counterterrorism actions and American advisers have joined in of late as well. 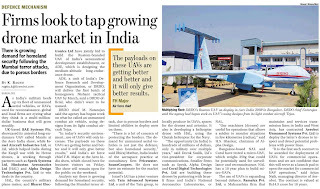 Also, India has recently signed some significant defence contracts with the U.S. and Israel for maritime reconnaissance aircraft and more modern surveillance systems, among other things. But India and the West should lose no further time in making common cause against their joint enemy. Without abandoning its current, go-it-alone outlook and becoming a more formal part of the global war on terror, India has to realize that it will not be able to stop attacks on its soil. India is emotionally attached to the Non-Aligned Movement because it was founded by its first Prime Minister Jawaharlal Nehru (along with the leaders of Egypt, Indonesia and Yugoslavia) to keep equal distance from the Soviet Union and the U.S. during the Cold War. But the Cold War is long dead and India is living in a dangerous world today. Policies are formulated to serve nations, not vice versa. LAHORE, Pakistan (AFP) — US envoy Richard Holbrooke leaves Pakistan Thursday with a wish list for aid, but in no doubt about the challenge of eradicating Islamist havens in the nuclear-armed Muslim nation. Paying a first visit to Pakistan, Afghanistan and India to conduct a major review of US policy in the "war on terror", Holbrooke spent three days hearing a litany of woes and requests from the government and the military. Pakistan has been a vital US ally since former president George W. Bush invaded neighbouring Afghanistan to oust the extremist Taliban regime in Kabul for sheltering Al-Qaeda after the September 11, 2001 attacks. But relations between Washington and Islamabad have soured, not least in the wake of dozens of suspected US missile strikes against militants on Pakistani territory, which has weakened and embarrassed an already unpopular government. The United States is impatient over Pakistan's reluctance or inability to eradicate Islamist "safe havens" used to attack Western forces in Afghanistan. Pakistan wants an end to US missile strikes and billions of dollars in military and civilian aid to combat the Islamist threat in their own backyard. Military commanders say they urgently need attack and transport helicopters, drones for surveillance and targeting locations, night vision goggles for pilots and foot soldiers; and jammers to neutralise landmines and roadside bombs. Pakistan, whose 500,000-strong military -- the fifth largest in the world -- has deployed 110,000 troops in the semi-autonomous tribal areas on the Afghan border -- says it has only dozens of night-vision goggles. Lack of equipment precludes military operations at night, allowing Taliban fighters to operate with impunity under the cover of darkness. "This is an absolute must for the army to sustain its operations. It has to be better equipped and it must get these things," one senior military official told AFP on condition of anonymity. "We hope that with the change in administration, the offer to review policy and to understand Pakistan's perspective we'll get these things," he said. On the surface, the signals have been encouraging. Pakistan declared that new US President Barack Obama and President Asif Ali Zardari agreed on "active engagement" to turn the tide in the war on extremism. Officials here are quietly optimistic that the days of Bush unilateralism -- when they felt Pakistan was undermined and intelligence ignored -- are over. "A new package of economic assistance with a separate military component is expected. US reports say it involves 1.5 billion dollars a year, but we have to see what finally comes out," said defence analyst Talat Masood. "It (the visit) was meant to convey in strong terms that Pakistan has to eliminate Al-Qaeda and Taliban sanctuaries in the tribal area and Pakistan has to get control of these areas," said Masood. But Pakistan and the United States have so far disagreed on the enemy. Pakistan draws a distinction between those Taliban who confine their attacks to US troops in Afghanistan and others, like the Taliban in its Swat valley, who attack Pakistani soldiers and carry out suicide bombings here. But the United States wants Pakistan to take direct action against militants who are fighting its forces across the border in Afghanistan. Pakistan says first it must secure its own backyard -- more than 1,500 people have been killed in extremist bombings across the country in 20 months and more than 1,500 troops have died since Pakistan joined the "war on terror". Neither is Pakistan reassured that its perceived number one threat -- from India and the dispute over Kashmir -- is not in Holbrooke's mandate. The next step for Pakistan will be Washington. Prime Minister Yousuf Raza Gilani's office said Holbrooke invited officials for talks in March. Pakistan's army chief General Ashfaq Kayani is scheduled to visit Washington later this month for the first time since taking office. 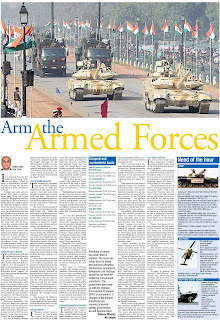 Shortage of Officers in the Indian Armed Forces – A Sign of Serious Class Prejudice? The Indian army has been facing a shortage of officers for some time now. This BBC report says that the Indian army is more than 11,000 officers short. 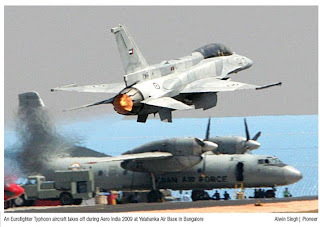 The Indian Navy and Indian Air Force too face a similar shortage. The Air Force needs another 6,000 officers and the Navy another 3,000. Ever since the private sector in India started to boom, the armed forces have not been topping the list of favoured careers for India ’s youth. India ’s generals, admirals and air marshalls complain that the armed services cannot compete with the private sector in terms of pay and perks. However, the above is just one side of the story. Here’s the other side. Whenever the Indian army wants to recruit men (that is jawans or privates, not officers), they do so through a recruitment rally. Very large numbers of Indian youth throng these rallies. Not everyone gets recruited. For example, a month ago, more than 50,000 young men came forward to enroll themselves in the Indian Army at a recruitment rally organised in the Samba district of Jammu and Kashmir. Of the 50,000 who turned up, only 10,000 were found to be fit enough to be hired. Once in a while, there are stampedes at these rallies and young men get killed. Yes, there is no shortage of men willing to join the army as privates or jawans. The obvious question which arises is, why don’t some of the non-officer personnel get promoted as officers? I don’t have statistics, but I don’t think many of our jawans get promoted to ranks beyond Subedar Major (Sergeant Major). The Indian army has not got over its colonial hangover. Take a look at this video. It shows a large group of officer cadets eating in old colonial style and being served by men who are most probably army privates. The Indian armed forces have not made a serious attempt to make themselves more egalitarian. For example, officers are still provided with batmen. In this day and age, making privates/naval ratings and airmen work for their officers as servants is so disgusting! The answer to the problem of officer shortage seems simple and straightforward. The armed forces should make it possible for its non-commissioned ranks to enter the hallowed officer class. The emphasis should be less on speaking perfect English and more on having the necessary skill-set and willingness and ability to learn. The Indian armed forces are almost a million strong and of this, the majority are non-officers. Surely it will be possible to select a few thousand of the brightest and best NCOs and make officers out of them? I found a five-year old news item which showed the Indian Air Force thinking on these lines. Since the Air Force still has a shortage of officers, I don’t think it has persisted with what it started in 2003.
ref the video--it is not army privates serving.thank God the army is retaing its colonial traditions & values given by British otherwise it would gone down the drain like currupt & incompetent indian beuroucracy. its evident that the author knows little about what goes into the making of an Officer in the Indian Armed Forces. Apparently the commentators above are under the impression that this post has been authored by me. I would like to clarify that I do not (as yet) author posts, but merely collate articles and posts concerning the forces at one place. The post concerning shortage of offices / commissioning of NCOs has been reproduced from another blog Winnowed . My comments on the post relect the views expressed by the anonymous commentators above.